In the world of the luxury car, Mercedes’ S-Class operates in a sphere of its own. And when its wick is turned up by AMG, the results are outstanding. In theory this car shouldn’t work. Surely a luxury limousine packing 612bhp and 664lb ft of twist, weighing more than two tonnes, would be all over the place – like an ocean liner with the performance of an off-shore racing powerboat. That the S63 AMG remains as luxurious and refined as any S-Class, while its vast performance reserves never feel like they’re at odds with the car’s USP, is an accomplishment that only Mercedes could pull off so convincingly. There are numerous subtle styling tweaks that mark out this S-Class as the fire-breather (slightly different headlamps, different air intakes, tweaked rear diffuser) but it’s when you see that the spare wheel cover has been crafted from carbonfibre that you get an inkling into the lengths that its designers have gone to in saving weight and keeping its sporting credentials high. All told, this model weighs 100kg less than its forebear. Other clues to its character are revealed in the cabin, which is a truly special environment in which to spend time. 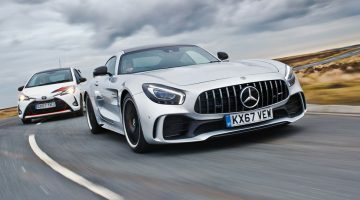 The steering wheel has a flat bottom and Alcantara is liberally used for upholstery on the more supportive seats, as well as the roof pillars, while the AMG logo is embossed into the seat backs – just enough of a hint at what’s underneath, without damaging the luxury vibe. There are plenty of useful innovations – something the S-Class has always been known for. Practically autonomous, you can leave this car to drive itself, accelerating, braking, steering and adjusting its speed according to the speed limit of the road you happen to be on. If it thinks something untoward has happened to you, it will drive itself until it’s safe to stop, sound alarms to see if you respond and, if not, will summon help from the emergency services. This is the appliance of science and there isn’t sufficient space here to list all the electronic trickery this thing has in its arsenal. But there is another side to this car’s personality, made real by a thumping analogue heart that works perfectly in tandem with all that digital wonderment. Not everything with the letters A, M and G on its boot lid is a work of unparalleled genius but there have been more hits than misses and the S63 AMG does the nomenclature no disservice at all. 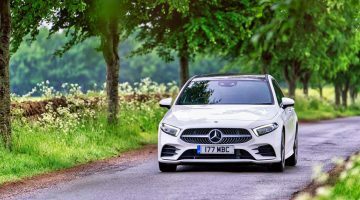 Its hand built engine is pretty much the same unit as fitted to the more diminutive E- and C-Class 63s – a twin-turbo V8 displacing just 4.0-litres, paired with a nine-speed automatic that sends drive to all four wheels. But the efficiency with which it goes about its business is remarkable, with potential fuel consumption and CO2 output figures that might shame a hot hatch. Obviously this is far from being a hot hatch in any respect but on the move it does manage to be exceedingly nimble and responsive, its special Airmatic adaptive suspension bending the laws of physics and giving the S63 an unnerving ability to tackle twisting back roads with as much capability as a car half its size and weight. And when you really get on the gas, well that’s when it reveals the trump card it’s had up its sleeve the whole time. You might think that a car of this size would need a 6.0-litre blown V12 to give it some serious numbers but you’d be way off the mark. 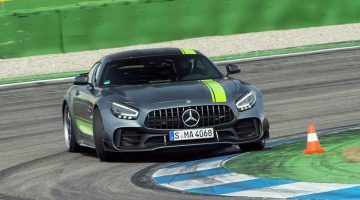 In this guise the eight-pot will, Mercedes claims (and the company isn’t given to exaggeration) reach 100kph from a standstill in only 3.5 seconds. Which is, quite frankly, ridiculous. It won’t go any faster than 300kph but that’s not because it can’t; it’s because there’s an electronic limiter in place. To be honest, though, in a car this big, anything approaching that speed can be terrifying. There’s something inherently hilarious about a luxo barge that can chew up exotica and spit it out into the weeds. It’s preposterous that something so soothing and unashamedly upper class can behave with such anti-social tendencies if so provoked, and that’s part of the reason we love it so much. It achieves the impossible by smothering away imperfections on the road and in our own driving abilities while delivering a performance hit that any supercar owner would be proud to boast about.